Art Case Vose Baby Grand Piano, Mediterranean Style-Collector’s Item. 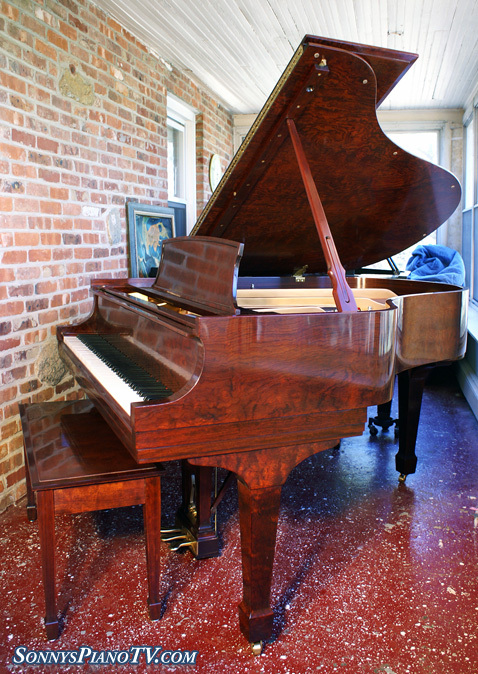 Absolutlely gorgeous walnut, double legged 5’4″ Baby Grand Piano. Only two others known to exist. Probably special order from Vose of Boston. Circa 1930’s, just refinished, rebuilt around 10 years ago. New pins, dampers, strings, hammers, bushings, key tops, plays great looks incredible. See photos for more detailed photos of the grain. Free LI/NYC delivery. All else continental USA only a $475. for delivery & set up in your living room. Comes with Warranty. Questions? Call Sonny Direct at 631 475-8046. Sonny’s Piano TV – “Crown Jewel” Steinway Grand Piano Model M 2001 Kewazinga Bubinga – See Video Tour! 2001 Steinway Grand Piano Model M from the “Crown Jewel” Collection. Exotic Kewazinga Bubinga Wood. Mint Condition. Piano has little playing time. One family owner. Superb, sublime, magnificent tone and action response. Piano action just regulated. Mint condition. Like new! Steinway’s Crown Jewel Collection features Steinway pianos encased in magnificent woods, prized for their exquisite color and grain, and gathered from around the world. Steinway & Sons craftsmen meticulously match the grain from one end of the piano to the other, even across the beveled edge of the lid. Each Steinway Crown Jewel is an original handmade work of art, unique in all the world. Individually distinguished with a special limited edition medallion marking its rarity. This Steinway is made from Kewazinga Bubinga a very large West African timber, with many of the characteristics of rosewood. Distinguished by its red color streaked with dark purple, and its conspicuous pores, Kewazinga Bubinga is highly valued for architectural and design woodwork, and fine cabinetry. (details excerpted from the Steinway Website under Crown Jewel Collection) Free LI/NYC delivery. All else continental USA only $475. for delivery & set up in your living room. Comes with Warranty. Questions? Call Sonny Direct at 631 475-8046. Legendary Bechstein Grand Piano. Art Case Gloss mahogany. Built in 1950 rebuilt by Sap of Poland 8 years ago-no playing time since rebuild/like new! (Sap is considered by many to be the best rebuilders in the world) All new parts except beautiful original ivories and sound board which was shimmed as is the custom in Europe to preserve the original high quality older wood that the European sound boards were built from. Abel hammers. Rich, robust, resonant, sublime Bechstein tone. Powerful and elegant, action well regulated. Free LI/NYC delivery. All else continental USA only a $475. for delivery & set up in your living room. Comes with Warranty. Questions? Call Sonny Direct at 631 475-8046. White Gloss Schumann Grand Piano. Robust sound, rich tone, pretty off white gloss finish, fast, responsive action. Made in 1988, piano has very little playing time, insides are like new, case in very good condition. Comes with Warranty. Free delivery LI/NYC. All else continental USA only $475 for delivery and set up in your living room. Questions Call Sonny Direct at 631 475-8046. Click Here to See Sonny’s Steinway Video Tour! Gorgeous Mahogany Steinway Grand Piano Model M 5’7″, made in 1928 the heyday of piano manufacturing in America, all hand crafted piano, cast iron plate made in the Steinway foundry which many believe is why the pre-world war 2 Steinways were superior to those that came after world war 2 when they started farming out the manufacturing of the plates to outside contractors. This piano just received a French Polish (several coats of varnish hand rubbed over original finish to give piano an even sheen and a like new look)and had the action regulated and the entire piano refurbished. 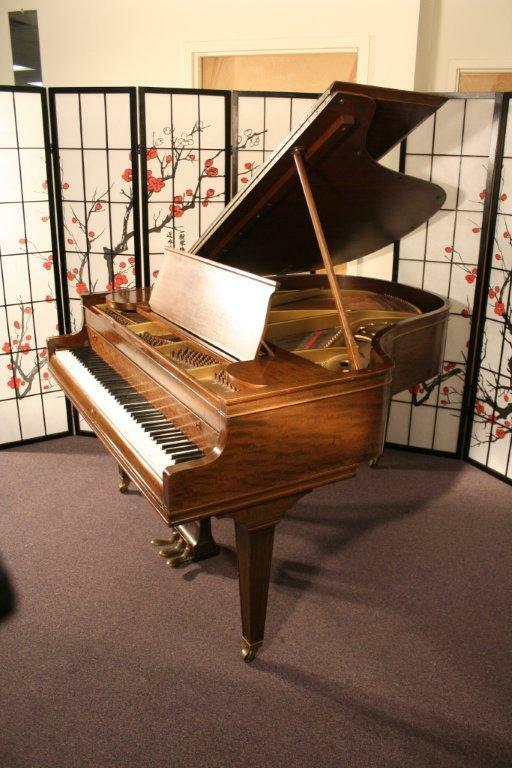 Has classic 1920’s Steinway sublime tone and action repsonse. This piano is going to make someone very happy. Questions? Speak with Sonny direct at 631 475-8046. Warranty & free shipping and set up on Long Island & NYC all else continental USA only $475 for same.